With a commercial space of 30,000 square meters on the site of the former customs port, the Rhein-Galerie provides an attractive access point to the Rhine with the adjacent river promenade. Its striking architecture and membrane roof, in particular, make it very distinctive. The wave-like rhythm of the supporting structure’s side arches was a particular challenge in terms of steel construction. The welding construction was transformed into a practical bolted construction, which thus simplified assembly and cut costs. 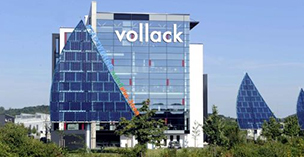 Vollack was responsible not only for the construction and manufacturing, but also the entire logistics right through to installation.